My Five Favorite Things To Do at Sturgis Rally, 2018 | Hupy and Abraham, S.C. There is so much to do and see during the Sturgis Rally that it’s almost impossible to list everything that’s going on. Many riders go there to party, hear their favorite bands and partake of the crazy night life. I go to Sturgis mainly for the riding. It’s much more enjoyable prior to or after the rally, since the highways and backroads are almost exclusively yours to enjoy, but I do enjoy reuniting with friends from around the country, so I endure the crowds for this annual reunion. If I had to list the five favorite things I’m looking forward to this year, they would be my preferred road trips, a little Indian vs. Harley race competition, and some of the best motorcycle as art displays anywhere. Let’s start with one of my favorite day rides. I know there’s a lot of talk about how beautiful Spearfish Canyon is, but for me the best and longest canyon ride is Vanocker Canyon. You can access Vanocker Canyon Road at the south end of Sturgis. It’s miles of twisting roads and scenic visual pleasures as you motor through the canyon walls towards Nemo Road. At that junction, I turn left on Nemo Road and continue all the way to Norris Peak Road. Turn right for more twisties and beautiful scenery until you end at Highway 44. Turn right until you reach Highway 385 and right again all the way to Deadwood. A great way to beat the days heat, enjoy the usually light traffic, and relax in Deadwood for some refreshments and sight-seeing. Another favorite ride starts in Keystone. Take Highway 40 east out of town just past the U.S. Interior Department sub-station. Turn right on Playhouse Road, which changes to N. Playhouse Road. At the juncture with 16A, turn left onto 16A and follow it to Custer State Park Visitors Center. Turn onto Wildlife Loop Road (CSP Road1) and continue past buffalo, pronghorn antelope, prairie dogs, wild donkeys and more. A great ride and plenty of photo opportunities. Stay on Wildlife Loop to Highway 87, then right and stay on 87 all the way to Needles Highway. 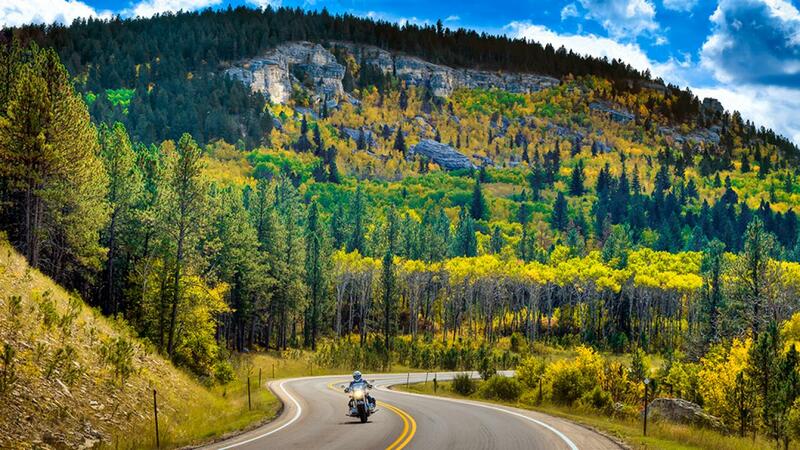 Needles is a challenging favorite of riders, with lots of hair-pin turns, tunnels, scenic overviews and more. At the intersection of 87 and Highway 385, turn right (north), and after a short distance, right again onto Highway 244 for a spectacular ride past large rock formations and huge boulders, winding around to the backside of Mount Rushmore. At 16A, turn left and continue back to Keystone. Racing at The Buffalo Chip. Sunday, August 5, the Motor Stampede American Flat Track Racing battle. It’s a continuation of the decades-old rivalry between Indian and Harley-Davidson. See some of the best racers in the country compete. A single-day pass to The Chip and races will cost $55, which includes a great concert after the race at the main stage, featuring “Theory of a Deadman.” On August 5, the racing continues in front of the main stage with the Hooligan’s race. Great Indian motorcycles, inspired by Roland Sands, race the track and make jumps in front of an enthusiastic crowd. The post-race concert features Eric Church, and a single day pass for this event will set you back $75, but well worth it. If you love custom bike shows like Mama Tried, you’ll love the Cycle Source Custom Bike Show. It’s free to the public on August 5, starting at 10 AM at the Iron Horse Saloon in Sturgis. 20 bike classes with lots of Knuckles, Pans and Shovels. Did I mention it’s free? Finally, my pick five for this year’s Sturgis is an annual favorite of mine. The Michael Lichter Motorcycle as Art exhibit. This year’s show if called “Passion Built-Garage to Gallery.” Famed photographer Michael Lichter has selected nearly 40 custom builders from around the country to display their work in this invitation-only exhibit. Complimenting the custom bikes is a corresponding 2-dimentional artwork display. I’m looking forward to seeing some of my friend's motorcycle builds, including Chris Callen, Dan Rogensvoog , and Kevin “Teach” Bass. Among the 2-dimentional artist displays is work from my friend Ray Drea. This show is free to the public and runs August 4-10, at the Buffalo Chip Events Center near the East Gate. I hope you enjoy some of the rides and events I plan on attending, and I’ll see you in Sturgis.